Enjoying some world class kiting on a great surface, perfect visibility and wind, down the Robison Glacier. At last a good session! And believe it or not it was 10C in the tent this morning! We started in a familiar strong gusty wind, horribly over-powered on poor surface; not what we’d hoped for, but we had to get moving. Within 5 kms our persistence paid off and for a short while we hit snow-kite perfection! Across the California plateau and down the Robison glacier was just dreamy. A smooth surface, perfect blue sky, light wind on an easy cross/downwind tack. We did 53km in 2.5 hours and were reminded why we came here with this ludicrous plan in the first place! 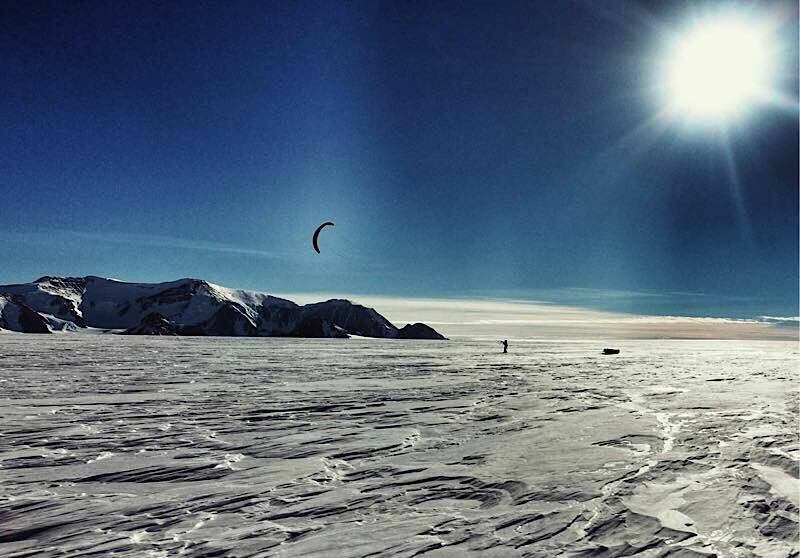 As we joined the Scott glacier the snow ran out and we started kiting on white ice. Nowhere near as sublime, but not too bad, still quick, but hard on the knees. Then we entered a heavily crevassed area. Most of the holes are filled in with snow and are quite visible. But there are lots and lots so we have had no choice but to kite straight over them at speed with the pulks racing along behind. Seems to working fine! There are also pressure ridge bollards positioned all over the place, which make for nasty hazards. The wind built and built until it was too dangerous and we had to call a halt to our progress. On releasing the kite things calmed down a little. It’s quite hostile out here in the middle of this massive glacier in 25+knots. We managed to find a small area of snow and popped up the tent. A huge bonus as camping on ice is grim. You can secure the tent with ice screws but the wind gets under the flysheet and isn’t at all relaxing. I really like this little tunnel tent. Our portable safe haven, that gives us space to survive and escape the magnificent, but savage wilderness outside. Mind you -not much space for 3 with full winter kit! And magnificent this place is! The mountains lining each side of the Scott Glacier are formidable! Some edging towards 4000m – there are some mighty battlements and some serious alpine objectives for those who wish to go one step further. Far away we can see Mount Grizzly, it is a beast! It must rise for 2000m above the glacier and as steep as the Grand Jorrasse. Remarkably, Mugs & Edmund Stump climbed several big mountains out here that are much bigger than they appeared in the photos! I think the Spectre is just out of sight! 35km away we could’ve been there in 2 hours! Now it all depends on what tomorrow brings! Could be another 2 days! Also we just had a poke around in a nearby crevasse and the snow bridge wasn’t quite as strong as we thought. And it’s really, really deep. We may have to devise a different strategy to get out of here in the morning.. Thank God you had a good day..things were looking a bit grim based on your last post. To the Spectre now! Good work Marra, sounds and looks amazing. the distance covered graphic says it all. Hope you get more good snow and a good wind. Go canny now your on the glacier. At the cottage had a lovely dinner, everybody is good your kids are growing like weeds. Be safe and have fun.